KANSAS CITY, Mo. — More people came to the Prospect Business Association meeting on Tuesday than ever before. “Generations of OGs with the younger people mashed together, blacks, whites, all for one cause to push the inner-city, Prospect, and turn it into Ward Parkway,” described Walter Lee Edwin, AKA The Popper. 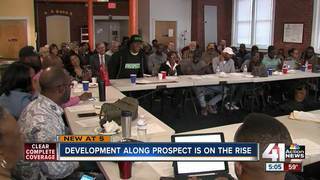 It was a meeting of the minds, all talking about the movement right now to revitalize the Prospect Avenue corridor. “I tried to leave Prospect but I’m always brought right back,” said Don Maxwell, a longtime east side developer. Maxwell is one of those aforementioned OGs, though he thinks it makes him sound a little old. “I can’t do anything about it, they’re going to call me OG anyway!” he said. Maxwell lead the effort in the 80s and 90s to develop the area around 31st & Prospect, bringing in strip malls, the old Country Mart, the Palestine neighborhood centers and more. He’s seen the rise and fall of Prospect. He says it went into decline (again) in the late 90s. Instead of retiring he helped form the PBA. Maxwell and all who were in the room Tuesday will tell you Prospect is on the rise. Kenneth Yancy, a local marketer, said minority business owners sometimes don’t know how to market themselves, and they go under. With the right marketing, he said, Prospect can prosper. “The Prospect corridor is full of businesses with ideas and concepts, so what we want to do is package those and find the right people to talk to,” Yancy said. Prospect was recently named an “Opportunity Zone” in a statewide economic improvement program. The PBA is working to get funding from the one-eighth cent sales tax commission, expand the Community Improvement District all the way down the corridor, build more housing, update the Palestine senior center, re-do the shopping center across from the brand new Sun Fresh — it goes on and on. The city council is also discussing councilman Scott Taylor’s “Revive the East Side” plan. It would funnel at least $13 million into the east side for housing, infrastructure, and job creation. The PBA wants to get a piece of that, though the plan is still in its early stages. The city council may vote on the plan on November 1. “Prospect is Kansas City. It’s the artery of Kansas City. It’s the hood, it’s the turf, it’s the blacktop. It’s the underdog. And people like to see the underdog win,” Popper said. Popper is a musician and business owner who grew up off College on 63rd. He’s worked with Tech Nine on the popular “Kansas City” single and even recorded his own song named after Prospect. Popper lives and breathes KC, so, naturally, he started his own clothing merchandise business located at 18th & Vine, IM KC. He said his Prospect t-shirts and hats are blowing up. He notices they’re turning Prospect from a negative to a positive. He and another community activist, Desmound Logan, are sort of the hype guys for Prospect. They started at 85th and went north, telling business owners about the PBA meeting. “It was packed. Lots of enthusiasm,” Popper said. That unity is what many community leaders will say has been lacking for so long on Prospect. That, and getting young adults interested. Now, not so much. “For many years none of us ever talked to each other so we didn’t know. So now we support each other and so we become the major cheerleaders for one another,” Maxwell said. 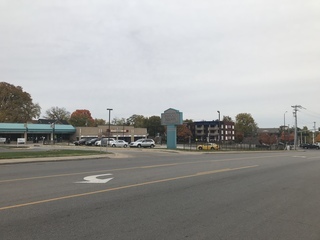 KIPP KC has rented space in the old Metropolitan Community College Pioneer Campus building at 18th and Prospect Avenue in Kansas City for eight years. Now, the charter middle school has bought the entire 95,000-square foot property as it embarks on a larger expansion plan. The school offers grades 5-8 and will add classes in kindergarten through fourth grade next year. School officials anticipate adding these grades will boost enrollment by more than 100 students, to around 380 total. While the extra space is needed, KIPP KC’s Director of Development Haley Bowman says buying the building is more about raising the school’s profile in the surrounding neighborhood. “We have families tell us all the time, ‘Oh, I had no idea there was a school at the corner of 18th and Prospect.’ Being able to establish ourselves in a big way in a community we love is really exciting,” said Bowman. Currently, the school’s entrance is on the building’s east side, facing Benton Boulevard. Two small banners with the KIPP name signal the school is inside. But school leaders already envision a bigger KIPP banner hung on the building’s south facade, looking out over the 18th and Prospect intersection. That, Bowman thinks, will create a “real sense of ownership” for students and families. “It’s been our home for years in name only. Ownership is a form of power,” she says. The school won the process to buy the building from the city with a $2.3 million bid. KIPP KC paid a 20 percent down payment financed through donations from several local foundations and individuals, along with contributions from some parents who have students at KIPP KC. Bowman says KIPP will gradually take over the old MCC space. Several tenants whom the school has shared the building with over the years will remain in the fall. They also have plans to eventually redo KIPP KC’s gym. For eight years, the school’s gym has been a warehouse-sized room with concrete floors with no painted lines and walls with no padded mats. The room, in fact, used to be where MCC’s auto shop classes were taught. The facility was so poor, KIPP KC’s basketball teams have never hosted true home games, Cobbins says. Instead, they’ve shuttled between other facilities around Kansas City. “For scrimmages, we get lots of people in here, lining the walls. Big-time support, and I’m like, ‘Imagine this with bleachers,'” he says. That won’t happen immediately. The school plans to renovate the gym next summer, after KIPP KC has taken over more of the building. Kyle Palmer is KCUR’s morning newscaster. He also reports and (sometimes) tweets. You can follow him on Twitter @kcurkyle. WASHINGTON – The U.S. Department of Transportation’s (USDOT) Federal Transit Administration (FTA) today announced the award of a $29.89 million grant to the Kansas City Area Transportation Authority (KCATA) for its proposed Prospect MAX Bus Rapid Transit (BRT) project. The project will extend BRT 10 miles south from downtown Kansas City and serve the area’s second-busiest transit corridor. “This grant will provide more options to Kansas City commuters in a very busy transit corridor,” said U.S. Transportation Secretary Elaine L. Chao. The Prospect MAX BRT, named for the street along which it will run, Prospect Avenue, will include 12 buses, 27 stations and two transit centers. Like the city’s other BRT lines, Main and Troost, it will receive signal priority at intersections as it operates in mixed traffic. The grant also will help fund improvements to sidewalks and approximately 50 existing bus stops. KCATA will receive $29.89 million through FTA’s Capital Investment Grants (CIG) program. The CIG Program provides funding for major transit capital infrastructure investments nationwide. Projects accepted into the program must go through a multi-year, multi-step process according to requirements in law to be eligible for and receive program funds. KANSAS CITY, Mo. — Pastor Modest Miles from Morning Star Missionary Baptist Church is thrilled about a big change that’s coming just down the street from his church. 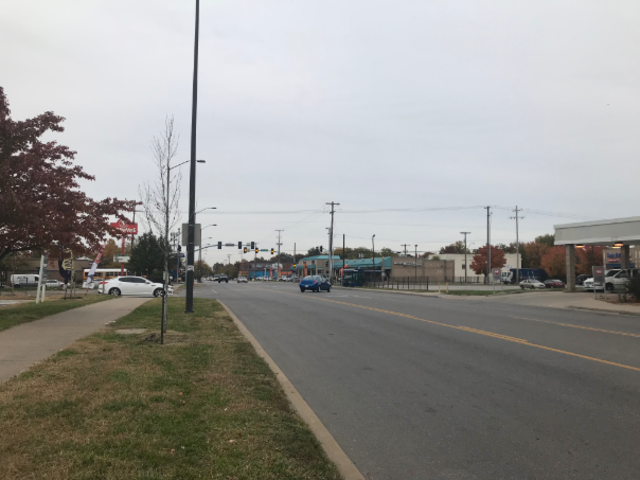 ”We’re all excited about what Kansas City Area Transportaion Authority is doing and how much they care about what’s happening here,” Miles said Friday. What’s about to happen at the southeast corner of 27th and Prospect has a lot of people in that area talking. ”My members can’t wait. I can’t wait. I’ve been working with KCATA for months to get this thing torn down. We need it so badly,” Miles said. You might say the pastor’s prayers have been answered. On Wednesday morning, workers will fire up an excavator that’s currently at the site and tear down a 4,200-square-foot, vacant building neighbors say has been an eyesore for more than two decades. ”For years that building has attracted prostitutes, drug dealers and some homeless folks have also broken through the boarded up door and windows to get in there. I once went inside and saw so many drug needles on the floor. All kinds of illegal activity has occurred there, and I’m so happy that it’s finally going to be torn down,” Miles said. The Kansas City Area Transportation Authority said at 10 a.m. Wednesday there will be a ceremonial demolition of the old building. “It will be like a celebration for all of us who live here,” neighbor Maxine Murphy said. Murphy and several of her neighbors plan to attend the demolition. ”I am so happy about it coming down. It should have been torn down years ago,” she said. ”Yes, it’s a good thing. It’s long over due. We need positive seeds and more revitalization to come to the Prospect Corridor,” another neighbor said. The demolition site is adjacent to the Kansas City Police Department’s new $74-million East Patrol Campus that opened during spring 2016. The site is also across the street from Morning Star Missionary Baptist Church’s new apartment complex for seniors, which is set to open in a few months. ”It’s just much-needed change for this neighborhood, and we’re just excited that KCATA is helping us make a difference in the community,” Miles said. The Prospect Business Association is committed to fostering a physically and economically sound community along the Prospect Corridor- From 18th to 39th Streets.